In the late 1800s, a couple of enterprising businessmen decided to make a lake in the San Bernardino Mountains east of Los Angeles. The forest was cleared, dams were built, and the creeks, streams, rainfall, and snowmelt from the surrounding mountains began to fill up Little Bear Valley, creating Lake Arrowhead. Best known today as a vacation destination, the water in the lake remains privately owned, a legacy of the Arrowhead Reservoir Company’s original plan for the 48,000 acre-feet of water: to sell it to towns in the arid valleys below. Arrowhead Mountain Spring Water officially takes its name from a rock formation in the San Bernardino Mountains. But news that the company, which is owned by the food giant Nestlé, has been pumping springwater out of the San Bernardino National Forest under a permit that expired in 1988 puts the brand more in line with the historic water grab of Lake Arrowhead than with any geological feature. The Palm Springs, California–based Desert Sun reported last Wednesday that Nestlé has been pumping water out of the underground spring that feeds Strawberry Creek and transferring it by pipeline out of the national forest on an expired permit for nearly 30 years. H2O from another spring-fed source that is bottled and sold with an Arrowhead label on it has been transported across the national forest under yet another expired permit since 1994. Conservationists say the reduced water flow in the creeks, especially after a dry winter, threatens the riparian habitats and the wildlife they support. 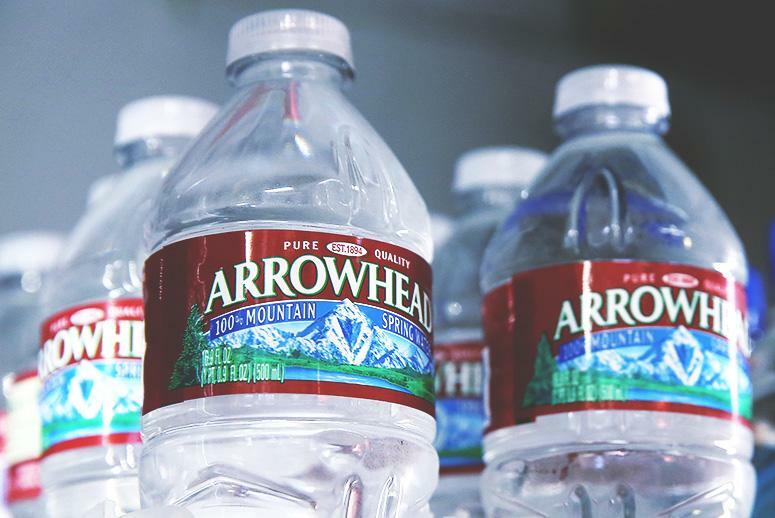 More than 135,000 people have signed a petition calling on Nestlé to stop bottling and selling California’s increasingly scarce water. Arrowhead is not the only company tapping California’s springs—Mother Jones reports that many of the country’s bottled-water companies get their product from the drought-plagued Golden State. The Strawberry Creek permit expired in the midst of a drought that ran from 1987 to 1992, and the state was excessively dry again in the early aughts. California’s current drought—by some measures the worst in 1,200 years—is entering its fourth year. The severity of this dry spell led Gov. Jerry Brown to call for 25 percent reductions in urban water use. “Now that it has been brought to my attention that the Nestle permit has been expired for so long, on top of the drought...it has gone to the top of the pile in terms of a program of work for our folks to work on,” Jody Noiron, the San Bernardino National Forest supervisor, told the Sun. Nestlé says it draws a negligible amount of water from the spring—705 million gallons annually, or enough to water two golf courses for a year, as the company said in a statement. To put that in context, scientists at NASA’s Jet Propulsion Laboratory estimate that California needs 11 trillion gallons of rain to end the drought. No, Arrowhead is not the new almond—some water-sucking scapegoat or bogeyman on which to lay blame instead of grappling with the complexities of climate change, water use and management, and conservation efforts. Nestlé CEO Peter Brabeck may have a penchant for privatizing water resources, but the pipelines running from Strawberry Creek didn’t cause the drought. But consider that, as the Sun investigation found, no state agency has an accurate grasp on how much water California’s 108 bottling plants use. Bottling companies are required to test water but not to report how much water is being bottled. Like Little Bear Valley slowly filling up with water, a natural resource trickling into a commodity—or the Owens Valley being drained dry to keep Los Angeles showers and sprinklers running—the expired Arrowhead permit is a symptom of a relationship with the climate that expects it to give well past its ability to do so. California can’t afford to sell its water to consumers in wetter states—just as it can’t afford to keep watering its expansive lawns or farm in ways that the market demands instead of what the rainfall dictates.